The splendid imagery on these cards, illustrated with a refined technique and extraordinary creative freedom, is the work of artist Vicente Arnás, coordinated by Gonzaga Gil-Delgado and Alberto Pérez. The decks were printed by Maestros Naiperos Españoles for Asescoin (Asociación Española de Coleccionismo e Investigación del Naipe), Madrid, as their special member's pack for 2004, as a tribute to the immortal literary masterpiece “El Ingenioso Hidalgo Don Quijote de la Mancha” and its author Miguel de Cervantes. 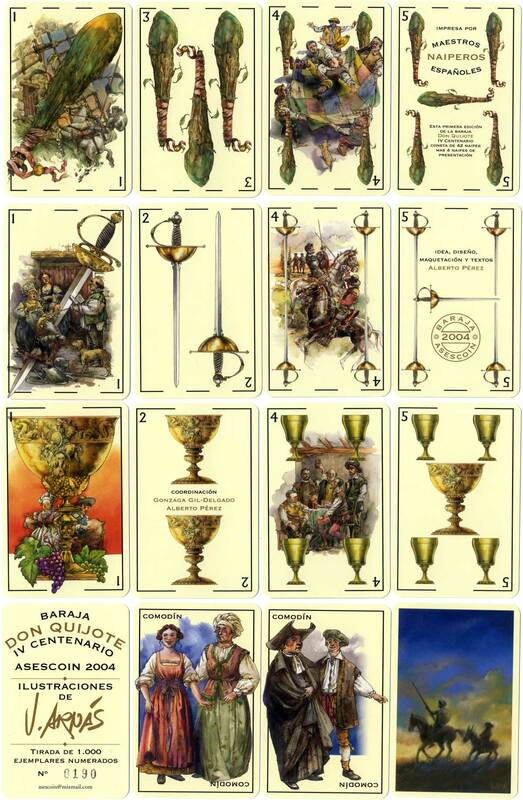 Above: first edition of "Baraja IV Centenario Don Quijote" published by Asescoin, Madrid and printed by Maestros Naiperos Españoles, 2004. Limited edition of 1000 packs, 42 cards + 4 extra cards in sturdy box. For further information about ASESCOIN and membership details visit their website: www.asescoin.es.